September 27, 2010, Greencastle, Ind. 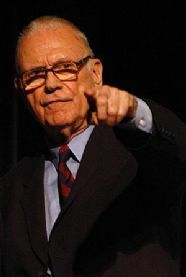 — "The world has changed in many ways over the past several decades, but here's one thing that's stayed the same: Lee Hamilton was always a significant voice in American foreign policy," noted NPR during today's Morning Edition. 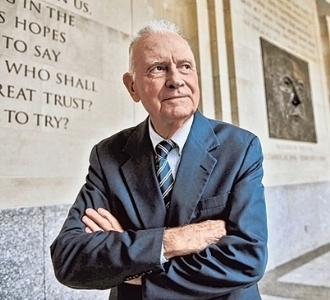 Now 79, Hamilton, a 1952 graduate who served 34 years in the U.S. House of Representatives and co-chaired the 9/11 Commission and Iraq Study Group, is leaving Washington to return home to Indiana. He was featured on the morning radio program today. "I think you come filled with ambition and drive and energy and wanting to accomplish great things, and you find the system is very hard to move, to make it work," Hamilton tells NPR. "And I think what has impressed me over the years is the sheer complexity and difficulty of governing this country." America's challenges "have become much more diverse and more difficult" since Hamilton was first elected to Congress in the mid-1960s. His concern for the future? "Whether this nation, so conceived and so dedicated, can long endure," he said, quoting Abraham Lincoln. "That was the operational question at Gettysburg; it's the operational question today. I worry a lot -- more than most people, I think -- about our ability internally to deal our problems than I do about external problems. I really wonder whether this country, moving in the direction it can, can solve the problems it has in front of it and continue to be #1 in the world." He added, "We have to make sure our resources match our ambitions." Hamilton is retiring as president of the Woodrow Wilson International Center for Scholars in Washington, D.C., and returning to his home state where he will continue to direct the Center on Congress at Indiana University in Bloomington. Hear the complete piece at National Public Radio's website. Hamilton was also featured in the September 16 Washington Post and the August 17 USA Today. Access a recent op-ed by the veteran statesman via this story.